I am probably the biggest fan of mushrooms, I always loved them, even as a child. I add them to almost all of my favorite savory dishes, like pasta, pizza, omelette etc. The flavor and texture of mushrooms is incredible and they are furthermore healthy. 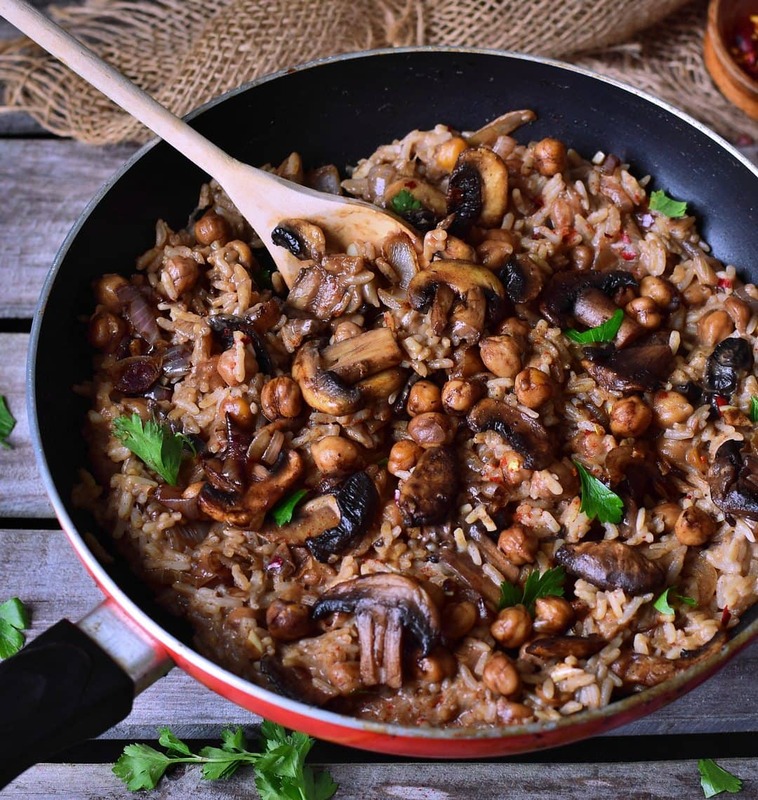 So let’s make this delicious creamy vegan mushroom risotto and throw in some chickpeas, because who doesn’t love some extra plant-based protein. 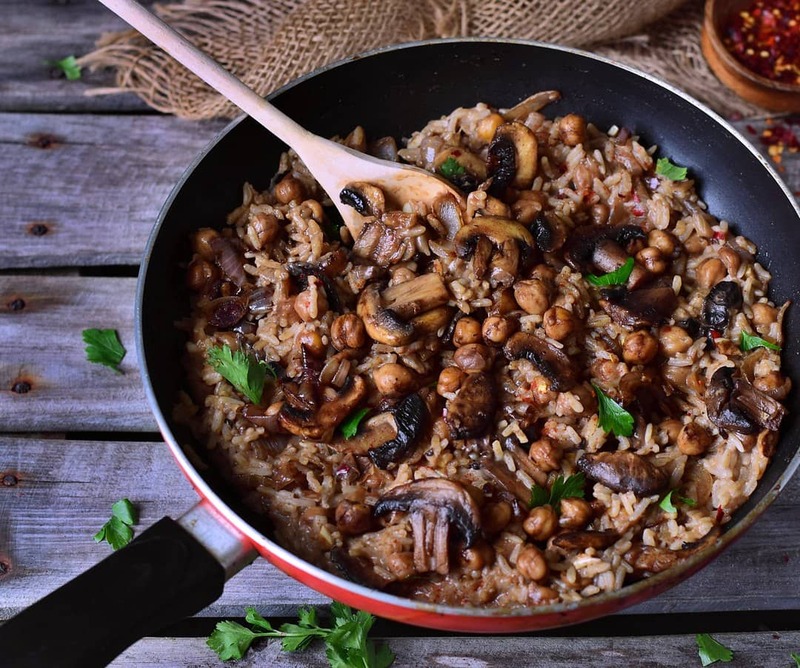 My healthy vegan mushroom risotto is the perfect comfort food and it’s ready in less than 40 minutes. This recipe requires only a few steps which aren’t complicated at all. Most mushroom risotto recipes contain cheese/parmesan but you can simply add nutritional yeast flakes to make this dish even more flavorful, delicious, and of course, vegan. You can make this delicious dish with risotto rice (for example arborio rice) and it will get super creamy. However, if you don’t have risotto rice at home then you can also use regular white rice (I tried both). 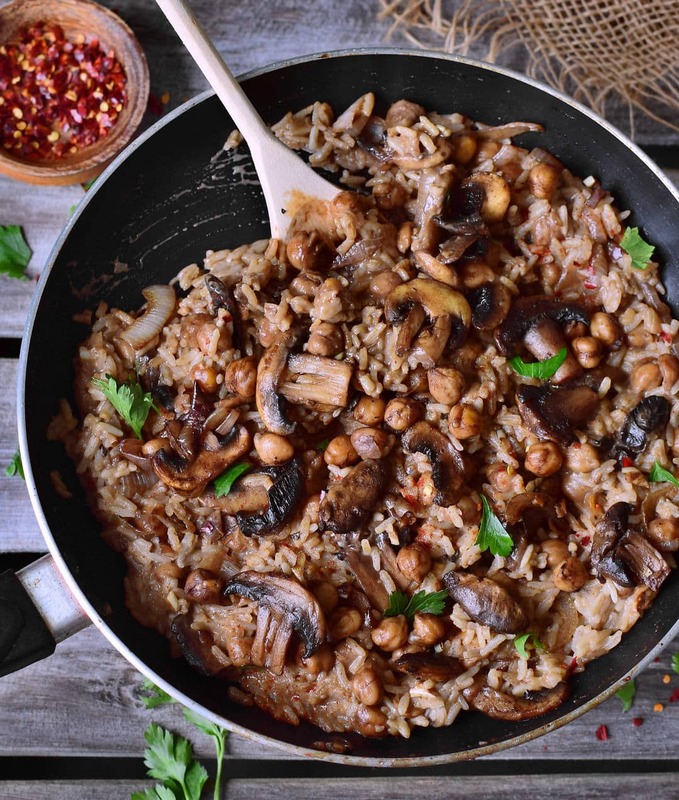 The vegan mushroom risotto will still turn out creamy and delicious because of the coconut milk. I love adding chickpeas to my dishes because they add healthy plant-based protein. 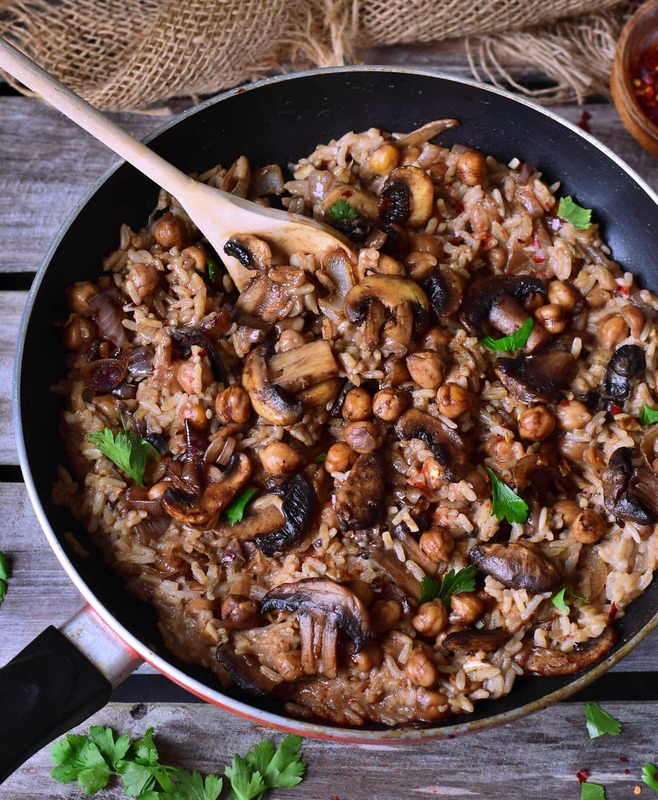 If you aren’t a fan of chickpeas, simply leave them out, the vegan mushroom risotto will still taste amazing. For more chickpea recipes check out my popular vegan chickpea curry. 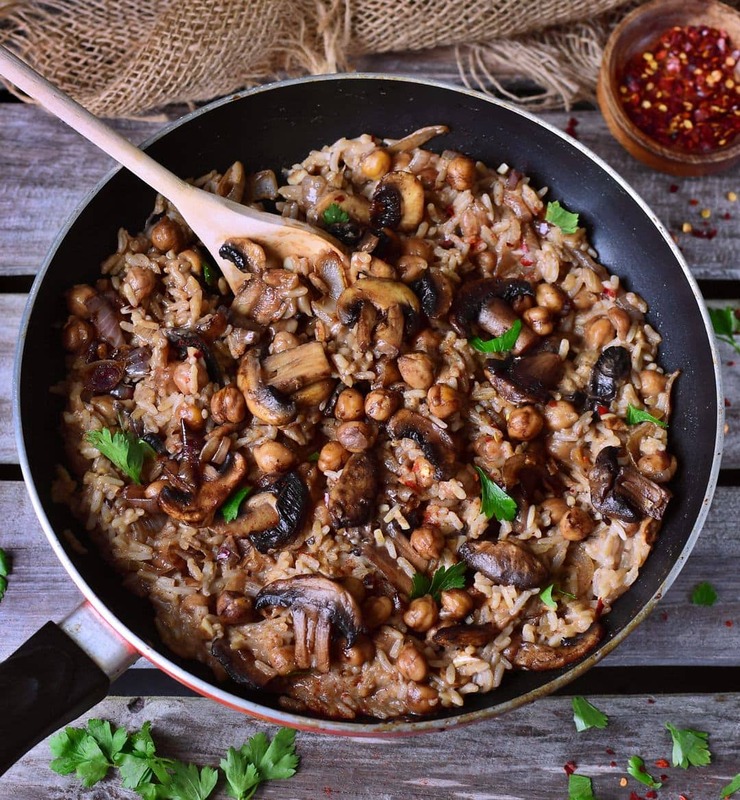 Should you recreate my vegan mushroom risotto recipe, please leave a comment below and don’t forget to tag me in your Instagram or Facebook post with @elavegan and #elavegan because I love to see your recreations. Vegan mushroom risotto in a creamy coconut sauce. This risotto is plant-based and gluten-free and contains healthy protein from chickpeas. A flavorful and easy to make recipe. Transfer the mushrooms mixture to the risotto rice, stir in the nutritional yeast flakes and enjoy! I sometimes make similar risotto, but I’ve never tried adding wine to it! Definitely, have to give it a try! I cooked it for the first time this evening partly to use up half a jar of chickpeas in the fridge. Enjoyed as did my American/Italian wife. But would suggest Shallots instead of onions. Italians always use shallots with Rissoto as they have a different flavour from onions and add a piquancy to the meal. Also used red wine as that’s all I had. 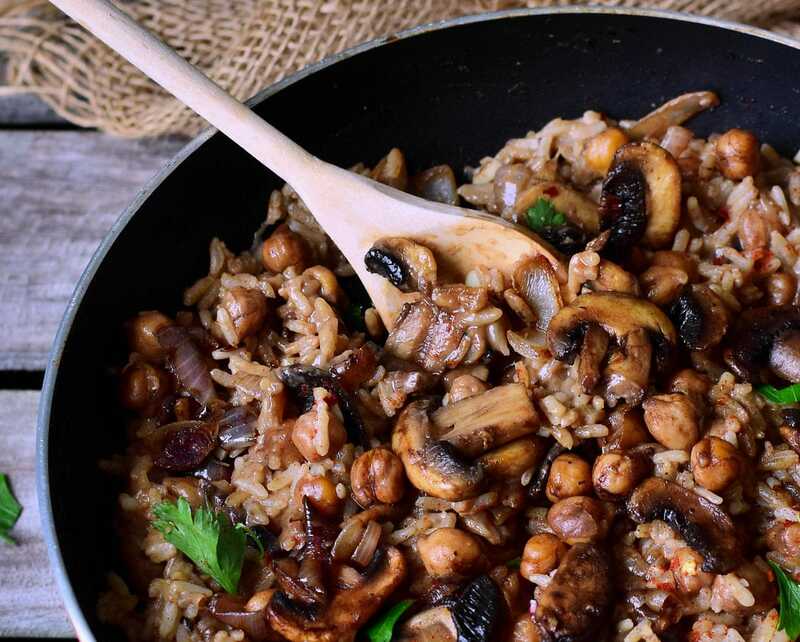 Found in practice red wine with mushroom risotto give a richer flavour to the rice. I‘m definitely a big mushroom lover as well! ???? This is such a delicious and nourishing recipe! I love that you add chickpeas so you have also a protein source. ???????? Absolutely love this recipe, Ela! I’ve always been a huge fan of mushrooms too – the umami is always so explosive! And risotto is my favorite winter dish! Can’t wait to try this out! I wish I liked mushrooms because this looks so excellent Ela! It looks so creamy and rich and satisfying. I love the flavor of mushrooms but sadly don’t like texture. I love that you added wine, it’s always such an excellent flavor booster to savory dishes! This recipe is so delicious! My whole family loves it. Yum! This was so flavourful and easy to make! I served it tonight with a roasted brussel sprout, sweet potato, pomegranate salad! My 15 month old had 3 bowls of the risotto… and would have kept going if I hadn’t cut him off! My kids always love your recipes! Oh my goodness!! I made this tonight for dinner, it took little effort, and it was DELICIOUS!! I doubled your recipe so thar the hubby and I could have it for dinner and lunch tomorrow, and we each went back for seconds. AND, I kept eating out of the pan as I was packing our lunch! 10 out of 10, this one is going into the weekly rotation, thank you!! Yum! 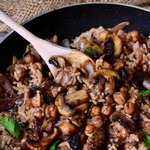 I don’t normally like mushrooms but I think mixed with rice and chickpeas plus a delicious sauce they’d be delicious!! Hi, what would be the measurement if I opt to ise fresh coconut milk (as I have access to them)? Thank you! My daughter-in-law made this yesterday for my birthday and I loved it. Brought some home and it was even better today. It is definitely a 10. This was so good! I used brown rice and then added a cup of pre cooked barley. I will definitely make this again!! I’ve been following you on the IG for some time now. I actually just realized you had your blog. So I took a stroll through your site and IMMEDIATELY fell in love with the Mushroom Risotto. Needless to say, I made a heaping skillet full tonight and was mad that I didn’t double your recipe (because,of course, it was delectable and I wanted leftovers for my first day back to work lunch tomorrow. Anywho…thank you for sharing. My family and I LOOOOOOOOVED IT! I will tag you in my IG post with a final result pic. This was DELICIOUS! This is going into my “5/5 rating file and is “omnivore company” worthy. I could tell my husband really liked it when he went back to get the scrapes out of the pan! That’s awesome, Renee! Makes me so happy to hear that you liked my vegan mushroom risotto ???? This was thebomb.com. I’m still new to veganism but my god this was so easy and delicious!!!! Thanks so much Ela!!!! Sorry im a new cook.. im confused with which white wine to buy?… theres white wine vinegar…is that the correct one i should get? I really want to cook this dish.. please help? Thanx! You need regular white wine (alcoholic beverage) which you enjoy to drink and NOT vinegar. Hope this helps. it did help, thank you so much! and omg! this was so delicious! my husband and i loved it! thanks ela! WOW this risotto looks and sounds so delicious! I love the recipe..i am going to try it..can u please suggest a substitute for the wine as it is not allowed for us(muslim) Thank u…. Hello, you can just leave it out. Amazing! I loved it! So simple and yet so tasty! Thank you for the recipe! It’s the first Elavegan recipe that I’ve tried but now I want to try them all! ???? This sounds so delicious, but my husband is not a fan of coconut flavor. Any substitute for the coconut milk? This recipe is fantastic – rich, nutritious, and filling!! Adding the chickpeas was a nice touch, and the coconut milk base allows for a lot of things to be mixed in. Since I didn’t have white wine on hand, I used mirin (sweet rice wine) as a substitute. It imparted a sweet and savoury taste. This was my first vegan recipe and now I want to try more! OhmyGOSH, Ela! This is just soooo delicious! I’m so glad I read the comments ahead of time so I made a double batch the very first time. I think I could eat this and nothing else for the rest of my life. Thank you, thank you, thank you! I stumbled across this recipe today and had the majority of the ingredients already in my cupboard. Simple instructions to follow and a healthy twist in overly creamy/cheesy standard risottos. This made a great meal and my daughter requested seconds. This is the best version of a mushroom stroganoff I have ever had! I more-or-less doubled the recipe… 1c rice, 1c wine, 1/2 of the onion for each pan, 8oz of mushrooms, 1 (15oz) can chickpeas briefly pulsed in the food processor, 1 (15oz) can high fat coconut milk, and 1/4cup nutritional yeast were the changes I made. Again— amazing and THANK YOU! That’s awesome, Lydia! Thanks so much for your sweet comment! What if I don’t have vegetable broth? Could I use water instead? Thank u so much for your blog and all the recipes which can inspire us! Why are you adding some balsamic vinegar and soy sauce in some recipes? What’s are their benefits? Good recipe (though used a bit extra broth in place of wine as didnt have any) next time, i’ll not put a spoon of yeast flakes into as cooking, and try it as garnish like you instruct…. my fault computer with recipe in different room to kitchen, got confused in between rooms.